Nicolás Maduro delivers a speech in Caracas. Officials from President Donald Trump's administration met secretly with Venezuelan military officers to discuss plans to oust President Nicolas Maduro but eventually decided not to help, The New York Times reported Saturday. Trump has been harshly critical of Maduro's leftist regime, as Venezuela has spiraled downward into a grave economic and humanitarian crisis that has sparked violent protests and prompted a wave of emigration into nearby countries. 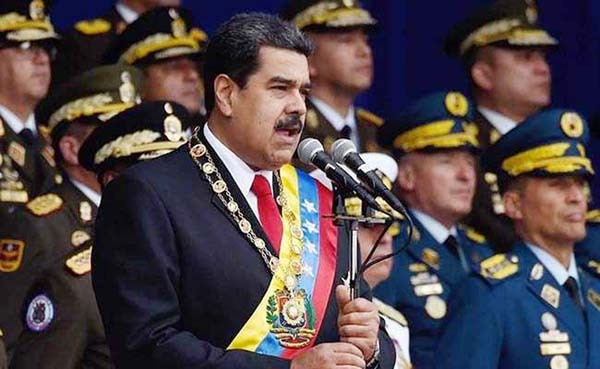 A National Security Council spokesman in remarks to AFP, said that: "US policy preference for a peaceful, orderly return to democracy in Venezuela remains unchanged." "The United States government hears daily the concerns of Venezuelans from all walks of life... They share one goal: the rebuilding of democracy in their homeland," added spokesman Garrett Marquis. "A lasting solution to Venezuela's worsening crisis can only arise following restoration of governance by democratic practices, the rule of law and respect for fundamental human rights and freedoms." The Times, citing unnamed American officials and a former Venezuelan military commander who took part in the secret talks, said the coup plans stalled. On Twitter, Venezuelan Foreign Minister Jorge Arreaza denounced "US government intervention plans and support for military plotting against Venezuela." "Right there in US media, new and disgusting evidence is there to see," he said. After explosives-laden drones allegedly blew up near Maduro at an August 4 event in Caracas-he blamed the US, Colombia and his domestic enemies-the State Department condemned the "political violence" but also denounced what it said were the arbitrary detentions and forced confessions of suspects. US National Security Advisor John Bolton insisted there was "no US government involvement" in the incident. In August 2017, media reports said Trump asked top advisors about the potential for a US invasion of Venezuela. Around the same time, he said publicly that he would not rule out a "military option" to end the chaos there. The collapse of Venezuela's oil-based economy under the increasingly authoritarian Maduro has led to dire shortages of food and medicine. Maduro has angrily blamed the US for many of his problems. The idea that the Trump administration might have even considered backing a coup attempt seems sure to fuel such charges. Mari Carmen Aponte, who was a top US diplomat for Latin American affairs under Trump's predecessor Barack Obama, told the Times that "this is going to land like a bomb" in the region.